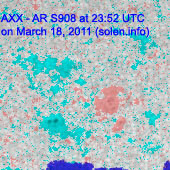 Last major update issued on March 19, 2011 at 06:40 UTC. 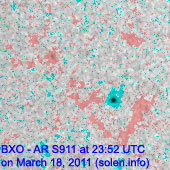 The geomagnetic field was very quiet on March 18. 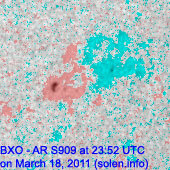 Solar wind speed ranged between 313-381 km/s. 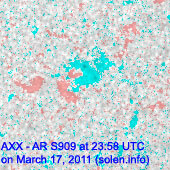 Solar flux measured at 20h UTC on 2.8 GHz was 87.6 (decreasing 21.8 over the last solar rotation). 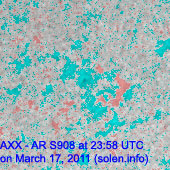 The planetary A index was 2 (STAR Ap - based on the mean of three hour interval ap indices: 2.5). 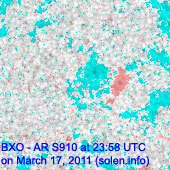 Three hour interval K indices: 00100111 (planetary), 11211100 (Boulder). 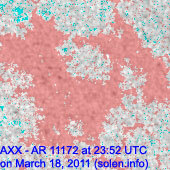 Region 11172 decayed and could become spotless today. 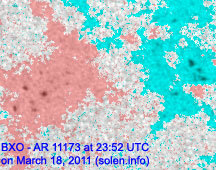 Region 11173 decayed losing spots and all traces of penumbra. 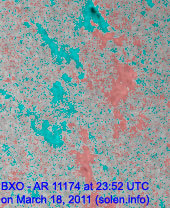 Region 11174 developed slowly and was quiet. 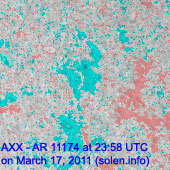 New region 11175 emerged in the northeast quadrant on March 17 and was numbered the next day by NOAA/SWPC. 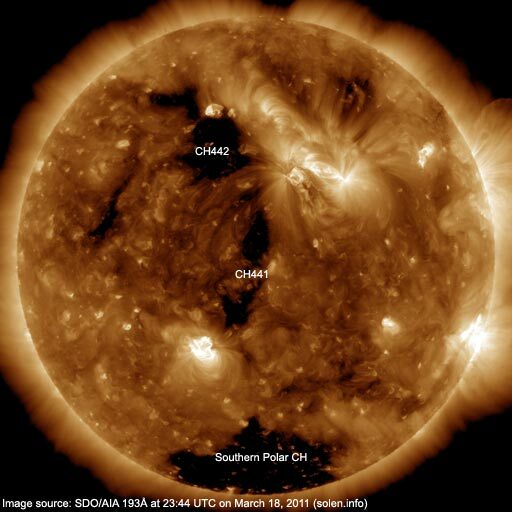 A trans equatorial coronal hole (CH441) was in an Earth facing position on March 18-19. 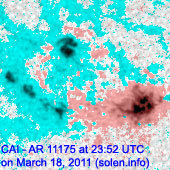 A coronal hole (CH442) in the northern hemisphere will be Earth facing on March 19-20. 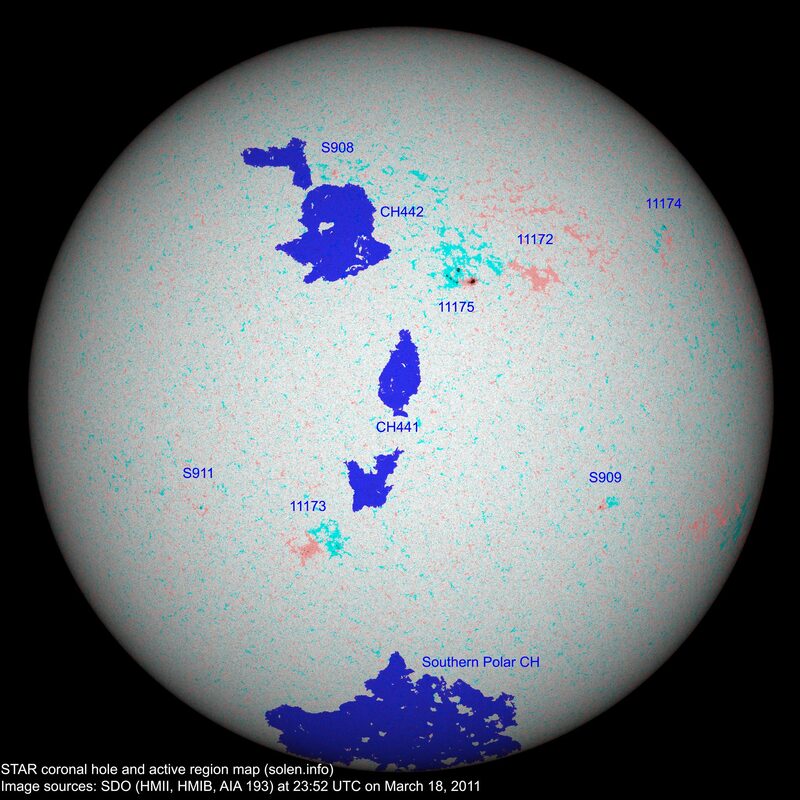 The geomagnetic field is expected to be mostly quiet on March 19-20. 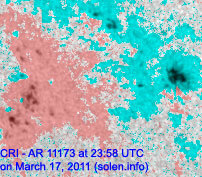 On March 21-24 there's a chance of some unsettled and active intervals due to effects from CH441 and CH442.